The City of Masbate (Bikol: Syudad nin Masbate; Cebuano: Dakbayan sa Masbate; Hiligaynon: Dakbanwa sang Masbate; Tagalog: Lungsod ng Masbate) is a third class city in the province of Masbate, Philippines. It is the only city in the province, that serve as its City Provincial Capital. It also serves as the main commercial center and the chief seaport of the Province of Masbate. It is noted for its well-protected port with Ticao Island acting as barrier against the effect of inclement weather from the northeast. Being located at the central part of the Philippine archipelago, the city serves as Bicol Region’s gateway to Visayas and Mindanao provinces. It is accessible through sea and air transportation. 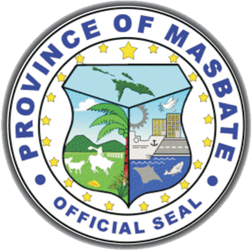 The City of Masbate is one of the major cities in the Bicol Region.The city domain is bounded on the northeast by Masbate Pass; on the southwest by the municipality of Milagros and on the northwest by a portion of Asid River and the municipalities of Milagros and Baleno. From Manila, the city is barely 212.5 aerial miles or 362 nautical miles. By plane, it takes more or less one hour to negotiate; by boat, 16 to 18 hours to ply. The city is more or less situated at the center of Masbate province, too, taking the tip of Burias Island as its northern most part and the tip of Esperanza municipality as the southern most part. The city serves as the dividing line between Luzon and the rest of the islands in the country. To the neighboring islands, Masbate City is three hours away by boat from the nearest point in Bicol mainland; three hours away from the nearest point in Burias; three hours away from the nearest municipality in Ticao Island; five hours from the nearest point in the island of Cebu and five hours from the nearest point in Panay island. According to the 2010 census, the city has a population of 85,227 people. In 2015, the median age of the province of Masbate based on the household population was 17.9 years. The province's median age for males in 2015 was 19.1, while that for female, 19.8 years. PSA Masbate updated and made available to the general public, the academe and to business enterprise the most requested statistics for the month of September 2017. The PSA Masbate, Provincial Statistics Office, Masbate City releases its monthly Consumer Price Index for May 2017.